. shinbutsu 神仏 kami to hotoke - the Deities of Japan . - - - .紅頗梨色阿弥陀如来 Gubari Amida Nyorai in red cloth .
. Bosatsu 菩薩 Bodhisattva Group . Daibosatsu is a term of Buddhist origin, and refers to a "great kami that has awakened to the Way of the Bodhisattva." Many of them are devas are deities coming from India and some have shrines with a torii 鳥居entrance gate dedicated to them. The division between Shinto and Buddhism is difficult here, ecpecially since many sanctuaries were erected before the separation of the two religions in Japan in the Meiji period.
. Ototen 乙天 Bishamonten .
. Wakaten　若天 Fudo Myo-O .
. MORE Fellow Pilgrims .
. Memorial Days of Poets .
. - - - kami　神　Shinto deities - ABC-list - - - . A "divine title" affixed to the name of a kami. A wide variety of titles have come into use in accordance with the unique characteristics of kami, and as a result of historical changes in the way kami have been understood. 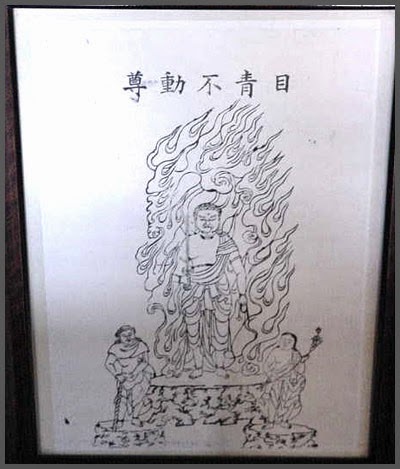 In the ancient period, the title mikoto was used, while expressions such as myōjin ("shining kami"), daibosatsu (great bodhisattva), and gongen (avatar) came into use as a product of kami-buddha combinatory cults (shinbutsu shūgō). 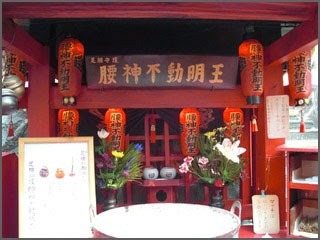 During the Edo period, the title reisha ("spirit shrine") was applied to the departed spirits of human beings. The title mikoto, written variously with the characters 命 or 尊 was used in ancient classics such as Kojiki and Nihongi as a title of respect for both kami and noble persons. It is believed that mi represents an honorific prefix, while koto means "thing," "event," or "word"; together, the reading mikoto has been interpreted as referring to a "noble personage," "minister" or "medium" (mikotomochi), and "noble child" (miko; see mikogami). Nihongi differentiates between the usage of characters 尊 and 命 for mikoto, stating that the earlier character is used to refer only to kami of the utmost dignity with direct linkage to the imperial descent, while the latter character is used for all other kami. The title myōjin 明神 as applied to Japanese kami is believed to evolved from an earlier term myōjin 名神 ("eminent kami"), which was used in ancient works like Engishiki to refer to kami of particularly noteworthy power. Under the influence of the homophonic myōjin 明神 ("shining deity") found in Chinese and Buddhist texts, the latter character combination came to be applied to indigenous kami as well. Daibosatsu is obviously a term of Buddhist origin, and refers to a "great kami that has awakened to the Way of the Bodhisattva." The title daibosatsu is first seen in 781, when the kami Hachiman was honored with the title Gokoku Reigen Iriki Jintsū Daibosatsu ("Great Bodhisattva of National Protection and Marvelous Spirit Power"). From that time, the title daibosatsu has been applied to numerous other kami, including Fuji Sengen Daibosatsu and Tado Daibosatsu. Gongen (avatar) is likewise of Buddhist origin, a term deriving from the doctrine of honji suijaku ("original essence, manifest traces"). According to this belief, buddhas may provisionally manifest themselves in this world in the form of kami or deities indigenous to various locales. Some well-known kami bestowed with this title include Kumano Gongen, Kasuga Gongen, and Hakusan Gongen. The title reisha originates with the Yuiitsu Shinto school of the Yoshida family, which first used the term to refer to a shrine erected over the grave of the school's founder. Mano Tokitsuna's Kokin shingaku ruihen describes reisha as "a general term referring to shrines devoted to the spirits of human beings," but the term was also later used as a title for the kami themselves. Within Yoshida Shintō, the titles reijin reisha and myōjin were all applied to deceased human spirits, and this usage influenced the use of the terms in other schools as well, including Yoshikawa Shintō and Suika Shintō, where they were applied to persons who had mastered the deepest imports of the religion. Some of these individuals included Yoshikawa Koretari, posthumously titled Miaredō Reisha, and Yamazaki Ansai, who was titled Suika Reisha. Another unusual example of the attribution of shingō to humans is that of Sugawara Michizane, who was titled tenjin or "heavenly deity."
. shinbutsu 神仏 kami to hotoke . Ich widme dieses Buch, in grosser Dankbarkeit, einem grossen Sensei, Dietrich Seckel. The best ONLINE introduction ! The first visit or ceremony for a Japanese deity is often a KIGO!
. shinbutsu in Edo 江戸の神仏 Kami and Hotoke in Edo .
. 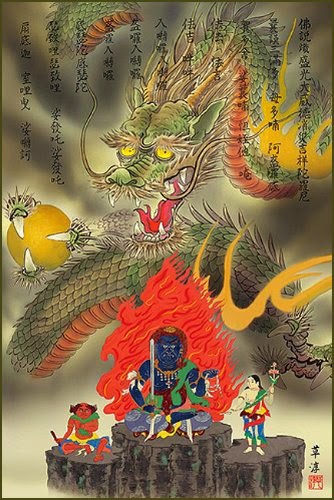 Legends about Fudo Myo-O . Who is Fudo Myo-O, the Wisdom King ? 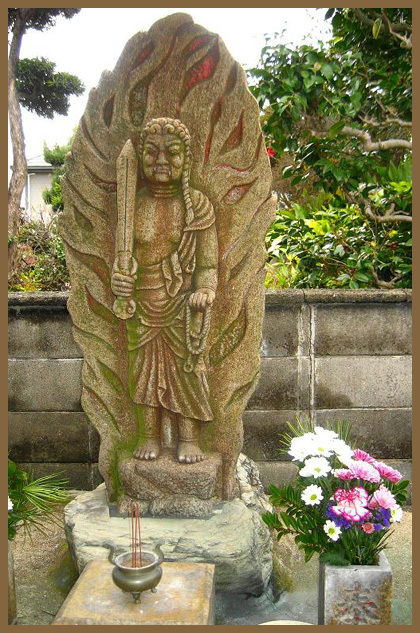 is a guardian deity primarily revered in Vajrayana Buddhism in Japan, China and elsewhere. He is classed among the vidyārāja and preeminent among the Five Wisdom Kings of the Womb Realm. Accordingly, his figure occupies an important hierarchical position in the pictorial diagramatic Mandala of the Two Realms. In Japan, Acala is revered in the Shingon, Tendai, Zen and Nichiren sects. Descriptions of his physical appearance derive from such scriptural source as the Mahavairocana Tantra (Dainichikyō (『大日経』)) and its annotation. His face is expressive of extreme wrath, wrinkle-browed,left eye squinted or looking askance, lower teeth biting down the upper lip. He has the physique of a corpulent (round-bellied) child. He bears a sword in his right hand, and a lariat or noose (kensaku (羂索)) in his left hand. 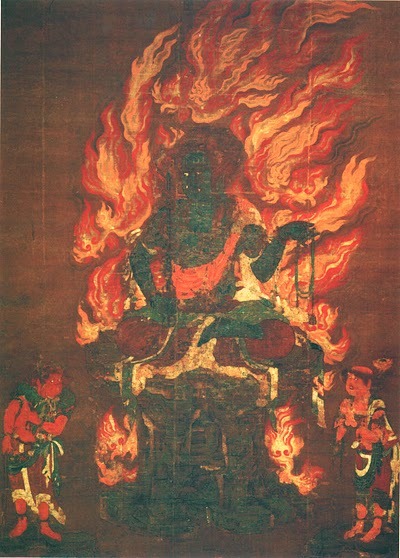 He is engulfed in flame, and seated on a "huge rock base" (banjakuza (盤石座)). Acala is said to be a powerful deity who protects All the Living (sattva, shujō (衆生)) by burning away all impediments (antar-aya, shōnan (障難)) and defilements, thus aiding them towards enlightenment. In Japanese esoteric Buddhism, according to an arcane interpretive concept known as the "three wheel-embodiments(ja)" or san rinjin (三輪身) Acala and the rest of the five wisdom kings are considered kyōryō tenshin (教令輪身 "embodiments of the wheel of injunction"), or beings whose actions constitute the teaching of the law (the other embodiments teach by word, or merely by their manifest existence). Under this conceptualization, the wisdom kings are ranked superior to the Dharmapala (gohō zenshin (護法善神)), a different class of guardian deities. Nevertheless, this distinction sometimes fails to be asserted, or the two are openly treated as synonymous by many commentators, even in clearly Japanese religious contexts. The Sanskrit symbol that represents Acala is hāṃ हां ( conventionally transliterated kān (kaan) (カーン)). However, it has been confounded with the similar glyph (हूं hūṃ), prompting some commentators to mistakenly identify the Acala with other deities. (The Sanskrit symbol is called siddham, bonji (梵字)), or "seed syllable" (zh: bīja, Ja: shuji (種子)). Some of the other transliterations and variants to his name are Ācalanātha, Āryācalanātha, Ācala-vidyā-rāja. The Hindu form of the deity may also be known as Caṇḍamahāroṣaṇa or Caṇḍaroṣaṇa "the violent-wrathful" one. whose name in Sanskrit signifies ācala "immovable" + nātha' "protector, Acala was incorporated into esoteric Buddhism (late 7th century, India) as a servant of Buddha. In Tang Dynasty China, he became Budong (pinyin: Búdòng; Middle Chinese: /pǝw dungx/- 不動, "immovable"), a translated-meaning-name derived from Acala. In turn, the deity was imported into Japan as Fūdō (不動) "immovable") by the priest Kobo Daishi Kūkai (died 835) who was studying in China as a member of the Kentoshi mission, and founded the Shingon sect of Japanese Buddhism. As the deity's importance waned in India and China (as did the religion itself), the iconic image remained popular throughout the Middle Ages (and into modern times) in Nepal, Tibet and Japan, where sculptural and pictorial representations of them are most often found. Much of the iconography comes from Japan, where a popular cult especially devoted to him has developed. In Tibetan Buddhism and art, the buddha Akshobhya, whose name also means "the immovable one", presides over the clan of deities to which Ācala belongs. Other sources refer to the Acala/Caṇḍaroṣaṇa as an "emanation" of Akshobhya, suggesting further assimilation. 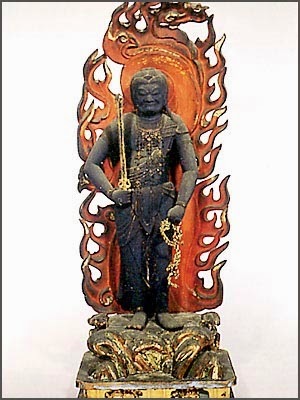 Fudō-myōō (不動明王) is the full Japanese name for Acala-vidyaraja, or Fudō (o-Fudō-sama etc.) for short. It is the literal translation of the Sanskrit term "immovable wisdom king". 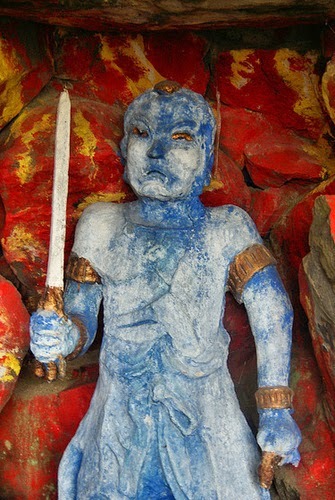 Acala in Buddhist art since the Heian era has depicted him as angry-faced, holding a vajra sword and a lariat. In later representations, such as those used by the yamabushi monks, he may have one fang pointing up and another pointing down, and a braid on the one side of his head. The sword he holds may or may not be flaming and sometimes described only generically as a hōken (宝剣 "treasure sword") or as kongō-ken (金剛杵 "vajra sword"), which is descriptive of the fact that the pommel of the sword is in the shape of the talon-like kongō-sho (金剛杵 "vajra") of one type or another. It may also be referred to as sanko-ken (三鈷剣 "three-pronged vajra sword"). However in some cases as in the Akafudo painting, the divinity is seen holding the Kurikara-ken, a sword with the dragon coiled around it. The flaming nimbus or halo behind the statue is known as the "karura flame", after a mythical firebreathing birdlike creature, the garuda. The two boy servants who is usually depicted in attendance to Acala are named Kongara (Kiṃkara) and Seitaka (Ceṭaka) though there are said to be eight such boy servants altoghether, and as many as forty-eight servants overall. His seat, the banjakuza (盤石座 or "huge rock base") is considered an appropriate iconographic symbol to demonstrate the steadfastness of" the Fudō. In Japan, Acala became an idol of worship in its own right, and became installed as the gohonzon (本尊) or main deity at temples and outdoor shrines. 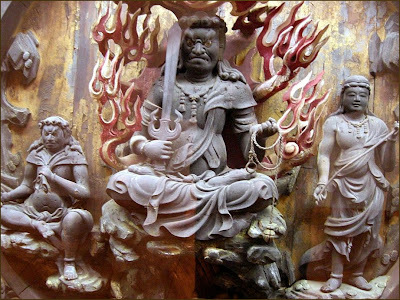 A famous example is the Narita Fudo, a Shingon subsect temple at Narita-san. At Shingon Buddhist temples dedicated to Ācala, priests perform the Fudō-hō (不動法), or ritual service to enlist the deity's power of purification to benefit the faithful. This rite routinely involves the use of the ritual burning ceremony, fire ritual or goma (護摩) (Skr. : Homa) as a purification tool. Lay persons or monks in yamabushi gear who go into rigorous training outdoors in the mountains also often pray to small Ācala statue or talisman they carry, which serve as his honzon. This praciticed path of yamabushi's training, known as Shugendō, predates the introduction of Ācala, so at first adored idols such as the Zaō Gongen who appeared before the sect's founder En no Ozunu or the Vairocana. But eventually Ācala was added to list of deities most typically enshrined by the yamabushi monks, either portable, or installed in outdoor shrines (hokora). These statues would be often placed near waterfalls (a common training ground) and deep in the mountains and in caves. Ācala also tops the list of　so-called Thirteen Buddhas (jūsan butsu (十三仏)). Thus Shingon sect mourners assign the Fudo the "First Seven Days" (Shonanoka (初七日)) of service. The first week is an important observance, but perhaps not as prominently important as the observance of "seven times seven days" (i.e. 49 days) signifying the end of "intermediate state" (bardo). Literature on Shinto Buddhist ritual will explain that such and such Sanskrit "seed syllable", or mantra or mudra is attendant to each of the "buddhas" for each observance period. But the scholarly consensus seems to be that the invoking of the "Thirteen Buddhas" had evolved later around the 14th century and became widespread by the following century, so this could not have been part of the original teachings by priest Kukai, but rather a later adaptation. is one of the Vidyârâjas (Myôô) class of deities, and a very wrathful deity. He is portrayed holding a sword in his right hand and a coiled rope in his left hand. With this sword of wisdom, Acala cuts through deluded and ignorant minds and with the rope he binds those who are ruled by their violent passions and emotions. He leads them onto the correct path of self control. Acala is also portrayed surrounded by flames, flames which consume the evil and the defilements of this world. He sits on a flat rock which symbolizes the unshakeable peace and bliss which he bestows to the minds and the bodies of his devotees. Acala transmits the teachings and the injunctions of Mahâvairocana to all living beings and whether they agree to accept or to reject these injunctions is up to them, Acala's blue/black body and fierce face symbolize the force of his will to draw all beings to follow the teachings of the Buddha. Nevertheless, Acala's nature is essentially one of compassion and he has vowed to be of service to all beings for eternity. Acala also represents his aspect of service by having his hair knotted in the style of a servant: his hair is tied into seven knots and falls down from his head on the left side. Acala has two teeth protruding from out of his mouth, an upper tooth and a lower tooth. The upper tooth is pointed downward and this represents his bestowing unlimited compassion who are suffering in body and spirit. His lower tooth is pointed upward and this represents the strength of his desire to progress upward in his service for the Truth. In his upward search for Bodhi and in his downward concern for suffering beings, he represents the beginning of the religious quest, the awakening of the Bodhicitta and the beginning of his compassionate concern for others. the thirteen deities (juusanbutsu 十三仏）. His vow is to do battle with evil with a powerful mind of compassion and to work for the protection of true happiness. To pray for recovery from illness and for safety while traveling is to rely upon his vow and power to save. Acala is also the guide for the deceased, to help save them and assist them in becoming buddhas for the first seven days after death. Read more about these 13 deities.
. 2 Articles by Richard K. Payne . CLICK for more samples - 不動明王 梵字 ! Just as Buddha Shakyamuni has 32 characteristic signs, Fudo Myo-O has 19. 1 He is an incarnation of Dainichi Nyorai. 2 His Mantra has the four letters : a ro kan man . 3 He usually lives in a world of fire. 4 He has the figure of a fat young man, rather unpleasant. 5 He has seven knots in his hair and a lotus blossom on top of them. 6 On his left shoulder a plait of hair hangs down. 9 He bites his right upper lip with the lower teeth and his left lip protrudes. 10 He has his mouth shut strictly. 11 He carries a three-pronged sword in his right hand. 12 He carries a rope in his left hand. 13 He eats the leftover food of ascetic monks. 14 He stands or sits on a throne of stone. 15 His body color is of an unpleasant black-blue-green. 16 His look is fierce and threatening. 17 He has a fiery Garuda bird on his halo. 18 A Kurikara Dragon is wrapped around his sword. 19 He has two child acolytes by his side. 05 - 06 . kami 髪 his hairstyle . 07 . suiha 水波相 wrinkles on his forehead . 08 . tenchigan 天地眼 "eyes of heaven and earth" . 09 . kiba 牙 the teeth of Fudo . 11 . gooma riken 降魔利剣 demon-subjugating sharp sword . 12 . kensaku, kenjaku 羂索 rope, lariat, noose . 14 . daiza 台座 seat, throne . 17 . koohai, kōhai 光背 mandorla, halo, Nimbus. 18 . Kurikara sword 倶利伽羅不動剣 . 19 . Sanjuuroku Dooji 三十六童子 36 Attendants .
. Ganjoojuin 願成就院 Ganjoju- In, Shizuoka . 19 Characteristic Signs of Fudo Myo-O.
. zazoo 座像 / 坐像 seated statues . CLICK for more photos of standing Fudo ! The temple was founded on behaf of 聖武天皇 Shomu Tenno in 739 by 行基菩薩 Gyoki Bosatsu. In the garden are 33 statues of Nyoirin Kannon, also made by Gyoki. The carver of the Fudo Statue is not known, but it dates back to the late Heian or beginning of the Kamakura period. 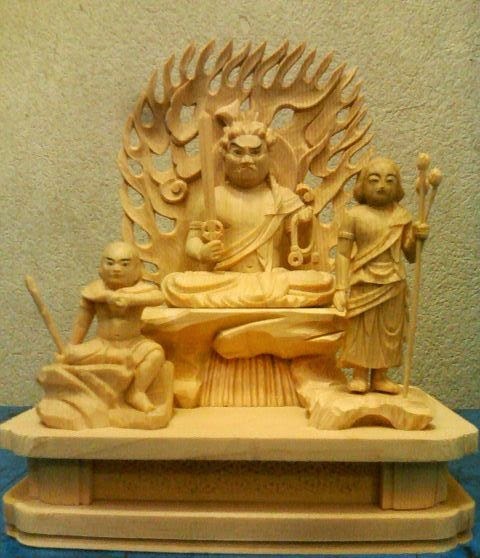 It is about 88 cm high and made from one piece of hinoki 檜 Japanese cypress. The temple has been founded in 1963 by priest 安部一僧正 with the sincere wish to save people. 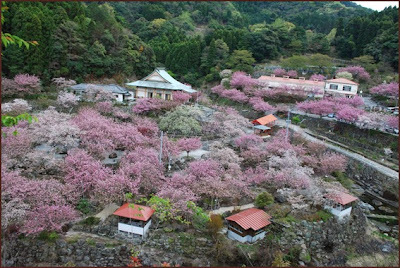 He made the road, planted the cherry trees and eventually was able to put the statue of Fudo Myo-O here in Tsukano village. The temple grounds are among the largest in Western Japan. 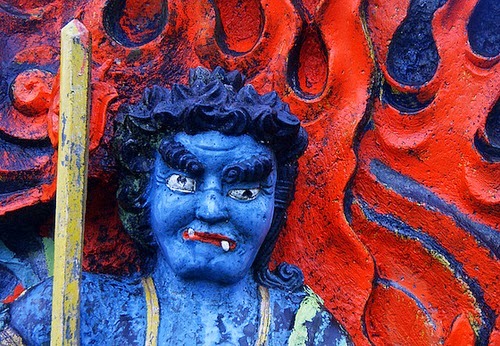 The Fudo here is 初七日導師 who leads the souls of the dead on the 7th day. His fire-halo lights the way for their proceeding to cross "Kurayami Toge"くらやみ峠 , the pass of darkness. 「初七日まもるは不動尊」. The bereaved family members come her on the 7th day after a death in the family and offer candles to light the way too. The Kannon of Medicine, holding a medicine flask 薬壺 like Yakushi Nyorai. Saint Kaizan Shonin 海山上人像（安部一僧正）the founder of the temple. 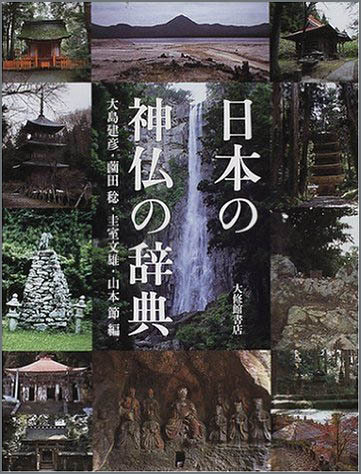 Nearby are the Isshinj Waterfalls 一心寺の滝 and the temple also houses the largest Buddhist bell 念佛鐘 in Japan. The cherry blossom time is the best to visit. ryuuzou　立像 - Also read ritsuzou. 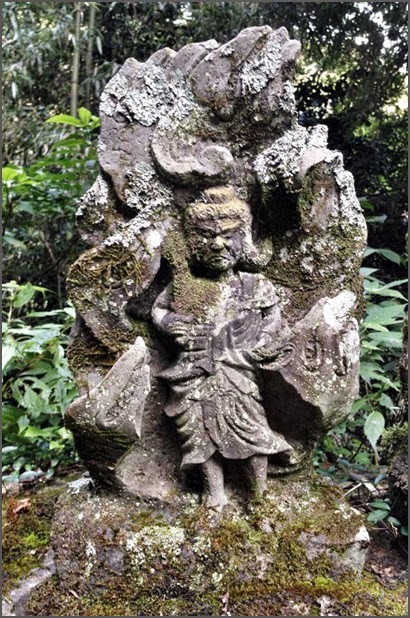 A Buddhist image which is standing, as opposed to seated (see *zazou 坐像). Most standing images stand up straight chokuritsu 直立 in a natural manner, but there are some variations. The bronze sculptures of bodhisattvas *bosatsu 菩薩 Nikkou 日光 and Gakkou 月光 at Yakushiji 薬師寺 in Nara, for example, stand in a relaxed position with most of the weight shifted onto one leg. The straight leg with the weight is called rikkyaku 立脚, and the bent leg without the weight is called yuukyaku 遊脚. Attendants of *Amida 阿弥陀 in the raigou composition (see *raigou-zu 来迎図) which have their knees bent forward are considered to be standing images called jiritsu 侍立. 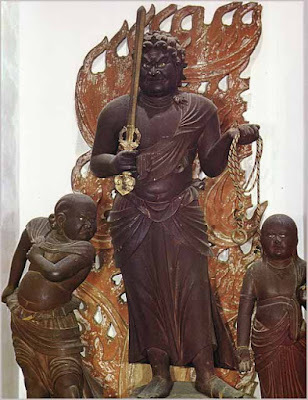 The bodhisattvas Kannon 観音 and Seishi 勢至 in the wooden Amida triad Amida sanzon 阿弥陀三尊 from Shourenji 青蓮寺 in Kumamoto prefecture (dated 1295) are the best known examples of ryuuzou. Zaou Gongen 蔵王権現 sculpted in wood in Nyoirinji 如意輪寺 in Nara (dated 1336), has one leg raised in a stamping or running position jaritsu 邪立. A walking image *gyouzou 行像 as typified by *kinhinzou 経行像, is also considered to be a type of ryuuzou and is contemplated during Buddhist meditation .
. Statues in Oogi, Ōgi 仰木 Ogi, Shiga . Entweder direkt frontal (chokuryuuzoo) oder mit leicht gebogenen Hüften (hinetta koshi) oder quasi im Laufen, mit einem leicht erhobenen Fuß (yugyoozoo, kinhinzoo, gyoozoo). Durch diese Laufposition wird der Wille Buddhas darge~stellt, in die Welt zu gehen und den Menschen zu helfen. Der Oberkörper ist dabei leicht nach vorne gebeugt. Diese Form findet sich besonders bei Jizoo und Kannon Bosatsu. Erste Arten dieser Figuren kennen wir aus Thailand. Ein Fuß stark angehoben wie beim Tanz (buseizoo) oder nach hinten gestreckt (teiji ryuuzoo) findet sich oft bei Myo-O-Statuen.
. Buddhastatuen ... Who is Who ... .
. Daruma - standing statues 置物 okimono . 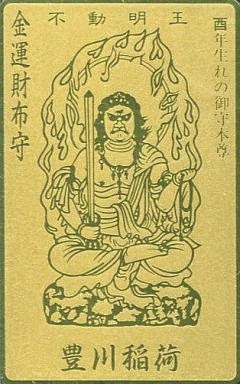 Green Fudo Myo-O 不動明王 . Most statues of green color are made from bronze (seidoo 青銅). Also sanzonzou 三尊像, sanzon 三尊. 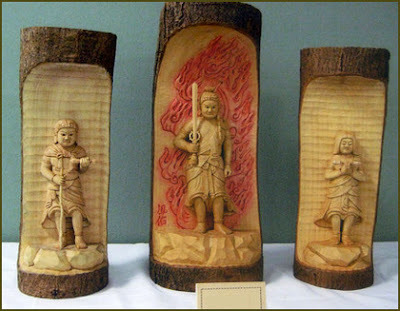 A set of three Buddhist deities appearing together. 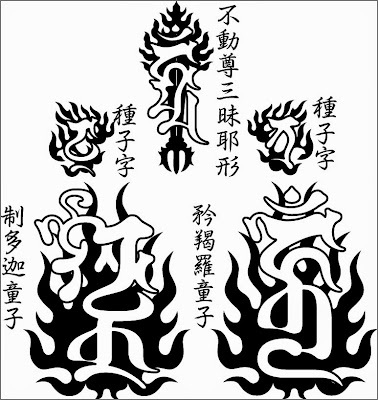 They form a triad with the principal image *chuuson 中尊 in the centre, and an attendant *kyouji, wakiji 脇侍 on each side. 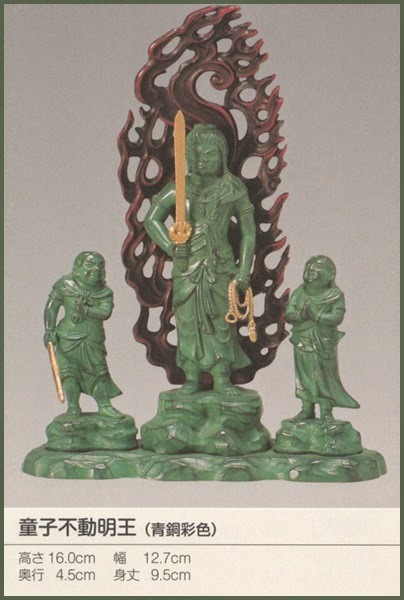 Amida sanzonbutsu 阿弥陀三尊仏 shows *Amida 阿弥陀　with two attendants. 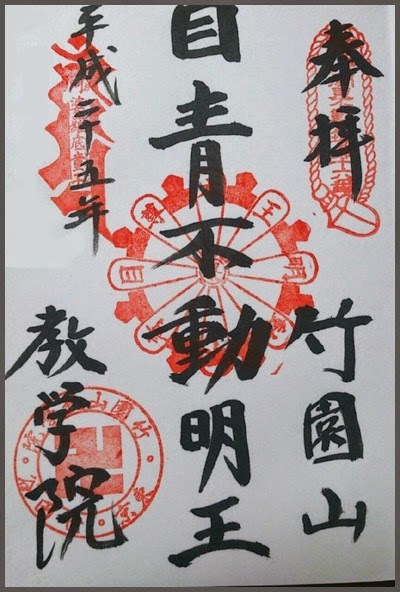 Frequent triads include Amida appearing with *Kannon 観音 and *Seishi 勢至 as attendants, Yakushi depicted with *Nikkou Gakkou 日光・月光, and *Shaka 釈迦 with *Monju 文殊 and *Fugen 普賢. 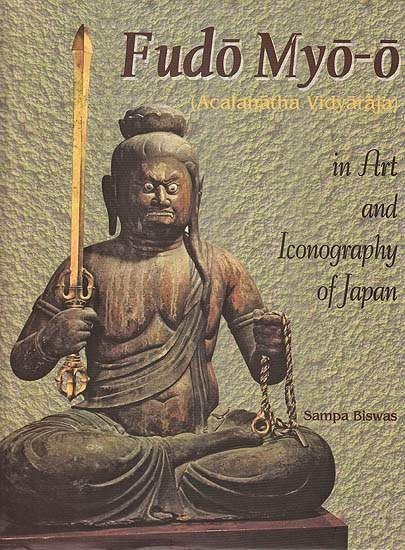 These groupings are based on Buddhist scripture and were firmly established in Japan in the Nara period (645-794), so statues made prior to this period do not necessarily follow this pattern. The Shaka sanzonzou 釈迦三尊像 in Houryuuji *Kondou 法隆寺金堂 (Nara), for example, shows Shaka attended by Yakuou 薬王 and Yakujou 薬上. In the Heian period, with the introduction of esoteric Buddhism, a large number and variety of sanzonbutsu were made. 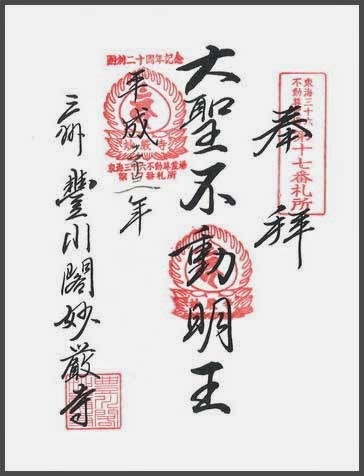 and *Bishamonten 毘沙門天 attended by *Kichijouten 吉祥天 and Zennishi douji 善膩師童子. 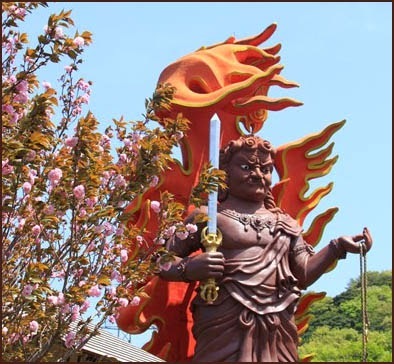 The special sword of Fudo Myo-O with a dragon.
. Dragon Art of Asia - Gallery .
. 八方厄除不動龍 Happoo Yakuyoke Fudo Ryuu .
. . . CLICK here for Photos - 龍 不動明王 !
. . . CLICK here for Photos - Dragon and Fudo ! 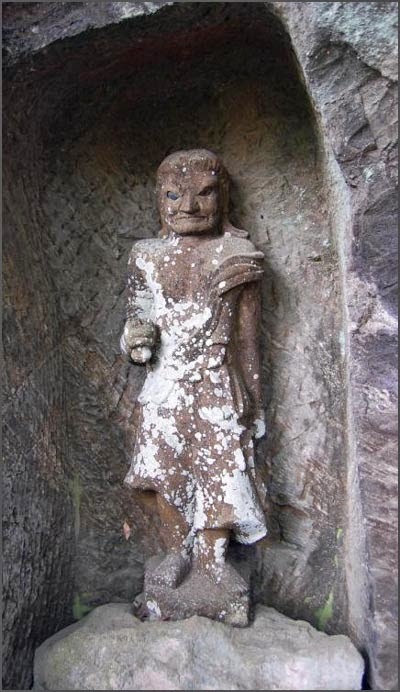 by adding your store or shop or information.
. Busshi 仏師 ... - Buddhist sculptors Gallery . Many have Fudo Myo-O on sale. Some are featured in the ABC list of this BLOG. Mumon was born in 1183, towards the end of the Sung Dynasty, 960-1279.
. Katsu !! - Koan and Daruma . The Gateless Gate is a personal pictorial reflection on the compilation of Zen cases referred to as the Mumonkan or Gateless Gate. There are many Shrines dedicated to Inari, the "Fox Deity" of Japan. Inari Ōkami (稲荷大神, also Oinari) is the Japanese kami of foxes. The most famous fox god shrine festival at Fushimi Inari in Kyoto is the most famous. The deity for a good harvest, venerated at Inari shrines.
. Inari Myojin 稲荷明神 Honorable Inari Fox Deity .
. Iizuna no Gongen 飯網の権現 . This is an incarnation of the Fox Deity, Inari. People pray to him for a bountiful harvest and good luck in business. He looks like a Tengu, a long-nosed goblin. Some Yamabushi sects think Iizuna (Izuna) is the original Japanese form (honji) of Fudo Myo-0, especially at Mt. 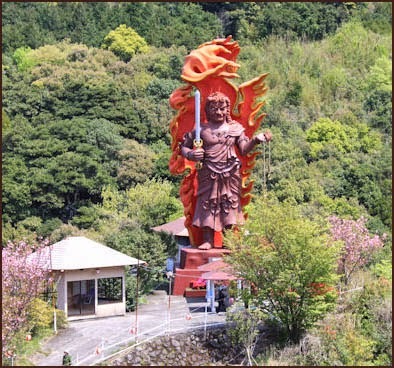 Takao near Tokyo.
. Dakini or Dakiniten 荼枳尼天 . She is also standing on a white fox. 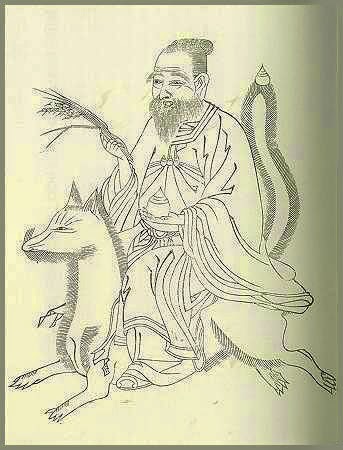 Kiko tennō (Noble Fox-heavenly Queen, 貴狐天王). 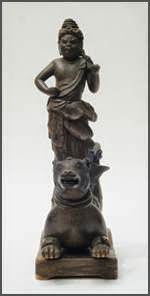 As a deity from India, coming to Japan via China, she was riding on a jackal. Since there are no jackals in Japan, she was depicted on a white fox. 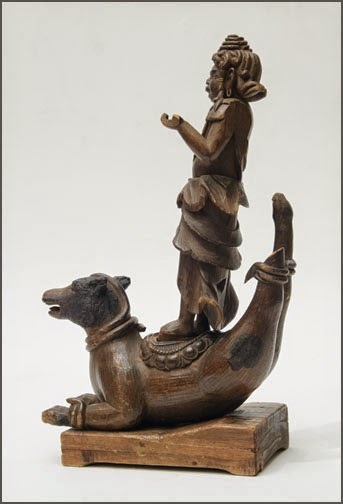 Image of Fudo Myoo standing on the back of Oinari. 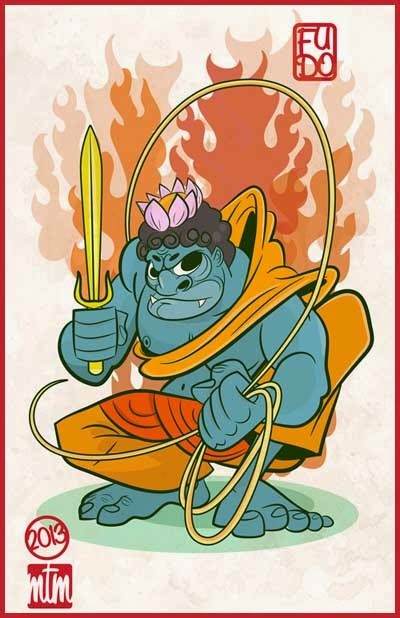 Fudo is the immoveable. He is the subduer of evil and stabilizer of the wisdom of the Dharma. 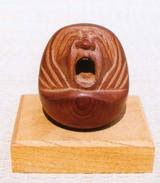 Oinari is the messenger to the gods in Shinto. He is worshipped by farmers and others for rice, rain, and children. He a beneficent deity. 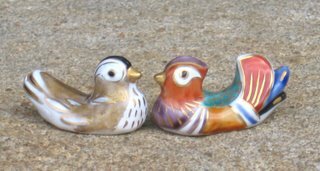 The two of these figures together means that this is a synthesis of Shinto and Buddhism. This is a part of an esoteric tradition in Japan. This shrine is most famous for the worship of Dakini Ten. 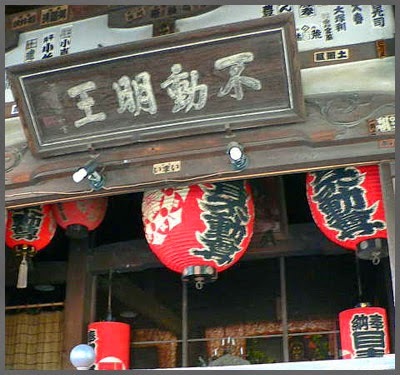 It was originally a temple for Dakini 妙厳寺 Myogon-Ji.
. kin-un, kin un 金運 amulets for luck with moneny. There are various statues with this name in Japan.
. asekaki 汗かき　/ あせかき　sweating deities . Mount Nokogiri (鋸山 Nokogiri-yama) literally "saw mountain" is a low mountain on the Bōsō Peninsula on Honshu, Japan. It lies on the southern border of the city of Futtsu and the town Kyonan in Awa District in Chiba Prefecture. The western side of the mountain is also the site of the sprawling Nihon-ji temple complex, which is the home of two Daibutsu sculptures - a huge seated carving of Yakushi Nyorai that at 31.05 metres (101.9 ft) tall is the largest pre-modern, stone-carved Daibutsu in Japan, and the "Hundred-shaku Kannon", a tall relief image of Kannon carved into one of the quarry walls - as well as 1500 hand-carved arhat sculptures, which combined with the spectacular scenery of the Bōsō Hills and Tokyo Bay, make Mount Nokogiri a popular tourism destination. 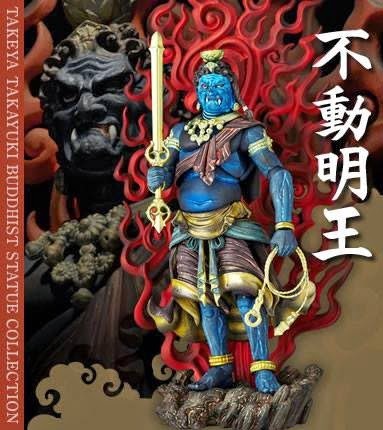 The statue of the sweating Fuod is behind the collection of 100 Kannon statues 百体観音. The statue would sweat as a prelude to some ill omen. It would also start sweating to make up for the sins of mankind. During the Muromachi period, whenever there was a major fight and battle in the country, this wooden statue would start sweating sacred sweat 霊汗. So it was widely revered by the warriors. This Fudo was also a protector of fires for the town of Edo.
. Kogakesan Fudoo-In Kokushooji 古懸山不動院国上寺 Kokusho-Ji .
. Goshiki Fudo 五色不動明王 in Five Colors . sometimes it is green, like in ao-ringo, green apples (the unripe fruit).
. aoi 青い　blue and green . The main hall of the temple is a big surprise. It's a Portakabin....., quite a large one for sure, but still its one of those temporary buildings that are dropped in to building sites. 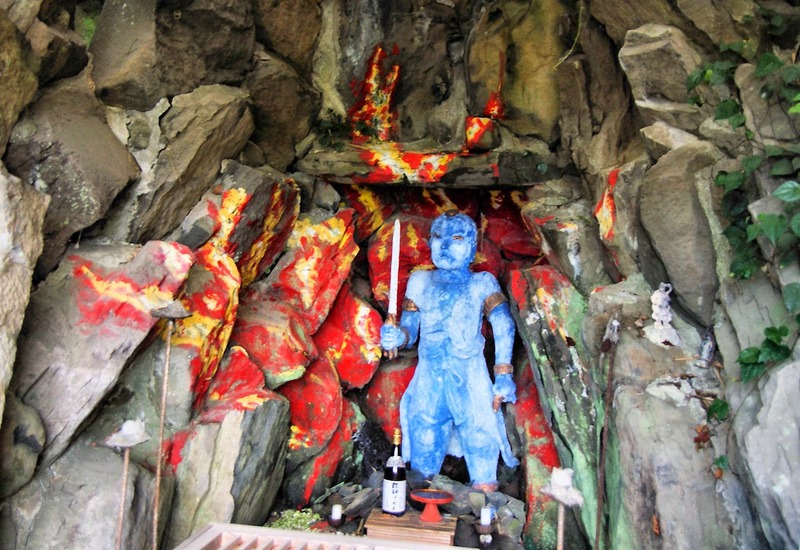 Behind the portakabin are a couple of altars and a small man-made cave containing a Fudo Myo statue painted bright blue. The rocks behind are painted with flames and its quite a quirky thing. "Don't hurry, don't rush, take it slowly, you are just right the way you are"
. 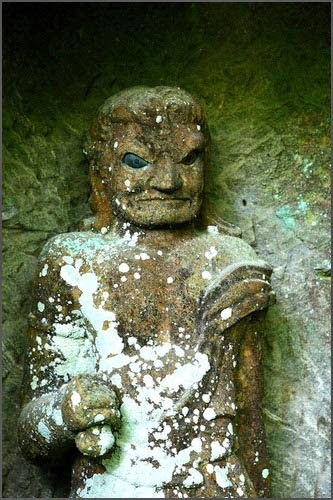 九州88ヶ所108霊場 Kyushu Pilgrims - Fudo temples .
. Green Fudo Myo-O 不動明王 .